Solar Vacuum tubes have been around since the early 1900s’.However, their use in solar heating is relatively new. When dealing with a vacuum tube solar heating system, one must be very cautious as the temperatures of vacuum tubes versus flat panel collectors can be as much as two times higher so overheating needs to be addressed properly to avoid damage and possible bodily harm. The Solar Vacuum Tube Technology works similar to a thermos bottle by trapping the heat inside and providing an insulation barrier against heat loss back to the air. Vacuum tubes are most effective in colder climates especially where freezing conditions occur. 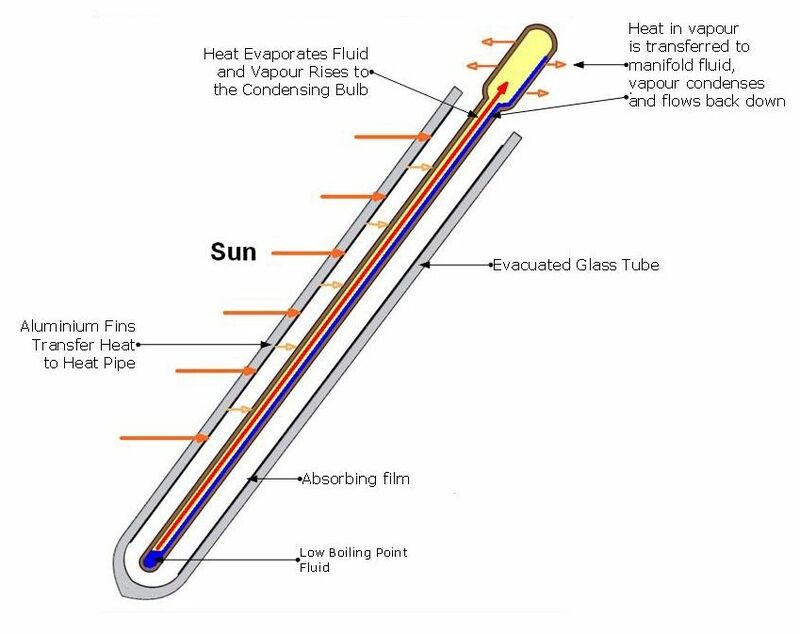 Our SunRain solar vacuum tubes utilize a copper heat pipe in the center of the tube.Using special aluminum fins, the solar energy is transferred to the heat pipe which contains a small amount of liquid that is under a vacuum. Physics dictates that liquid that are under a vacuum will boil at a lower temperature. Because of this phenomenon, the liquid inside the heat pipe boils at 30 degrees Celsius (86 F) and turns to vapor. The vapor rises to a condenser bulb whereby it is cooled by releasing heat through the bulb into the copper manifold and changes state back to a liquid, which sinks back down the heat pipe. CAUTION: these heat pipe bulbs can reach up to 200 Degrees Celsius (400 F) and causes a serious burn, so keep out of sun until final installation. The Solar Vacuum tubes are arranged in series and each tube plugs into a copper header. This header is where the heat exchange takes place and moves from the hot condenser bulb to the colder heating fluid that is circulated through the solar heating system. The copper header is well insulated with mineral rock wool so there is very little heat loss to the outside air. Therefore, the performance curve of a solar vacuum tube heating system is so much better than that of other solar collectors.